Capital High School’s Chris Penner did just about everything right in the second half. An errant pass at midcourt with two minutes to play in the game was one of the few miscues. 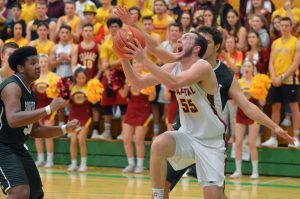 In leaped Grant Erickson, extending all of his 6-foot-6 frame to reach the ball before the opposition did. Erickson was successful and got the ball quickly back to Penner, avoiding a Capital turnover. For his efforts, Erickson crashed to the hardwood, his body landing with a painful looking thud. The most remarkable part about this specific play – Capital was comfortably up by 15 points and well on its way to win No. 20 on the season. Erickson could have elected against the potential bruises and no one would have frowned upon his decision. It’s the mindset the entire Cougars team has this season and one of several reasons they are heading back to the Class 3A state boys basketball tournament for the second time in three years. Penner scored 24 points, Gabe Landers added 10 and No. 9 Capital punched its ticket to the Tacoma Dome with a 59-52 victory over No. 16 Shorecrest in the regional round of the state tournament at Tumwater High School on February 23. The Cougars (20-4) will face No. 8 West Seattle (17-8) in the loser-out game at state on Wednesday, February 27 in Tacoma. The game will have a 9:00 p.m. start time. 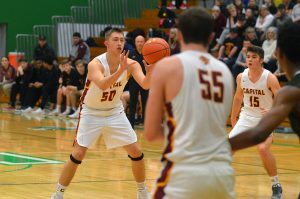 The Wildcats, runner-ups of the Metro League Sound Division, are coming off a 48-41 loss to top-ranked Eastside Catholic in the regional round. It will mark the Cougars’ first state tournament game since a 58-53 loss to Wilson during Penner and Erickson’s sophomore seasons. “The guys got a taste of it two years ago and they wanted to go back,” Capital coach Brian Vandiver said. It may have been only a one-game experience for the Cougars at state two years ago, but Penner, a two-sport standout who has already left his legacy in both the basketball and football programs at Capital, lists that game as his favorite memory of playing high school sports. He’s all set to bump that to No. 2 on the list. Capital also received nine points from Brandin Riedel in the victory over Shorecrest and six from Lucas Bowser, who Vandiver praised for his defensive performance. 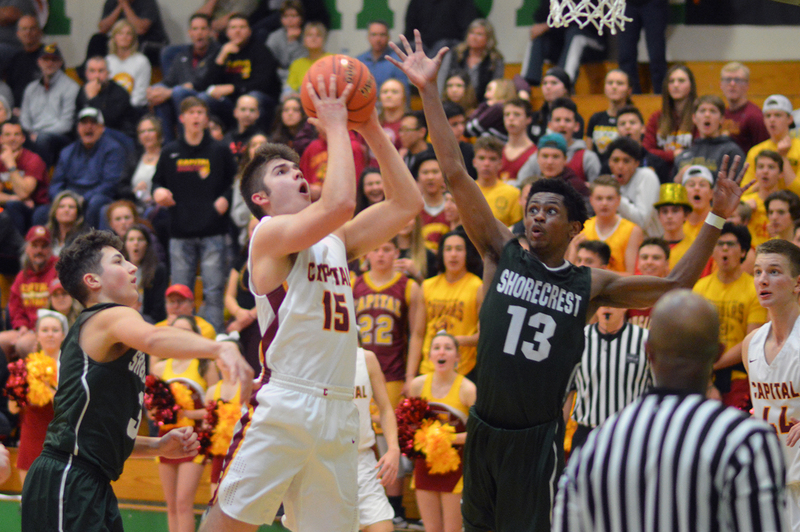 Trailing 28-19 at the intermission, Shorecrest (14-10) opened the second half on a nine-point run to tie the contest just 3 minutes into the third quarter. 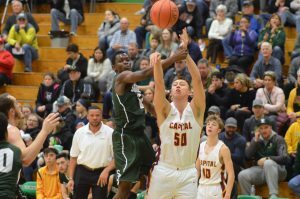 That’s exactly what occurred as the Cougars parlayed their strong defensive play into points which helped Capital build a 17-point advantage in the fourth quarter before holding off a late push from Shorecrest. Two years ago Capital ended a 12-year-old state playoff drought. The team now looks to post its first state tournament victory since the 1996 season – a year the Cougars collected their only state trophy, finishing seventh. 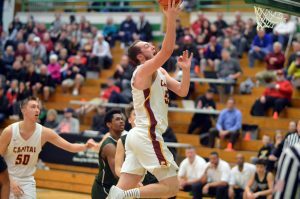 A win over West Seattle and Capital will face No. 2 Mount Spokane in the quarterfinals on February 28.